By now you know I have a penchant for long post titles. And this isn't among the longest. Furthermore, that has NOTHING to do with this post at all. lamp from our little sojourn to Paris. It is most decidedly in need of some help. some inexpensive one from somewhere. It's been sitting neglected and naked for quite some time now. I waffled some about what I would do with it. I considered burlap, other fabric. Covered with rolled fabric roses. Fabric that already had script on it. 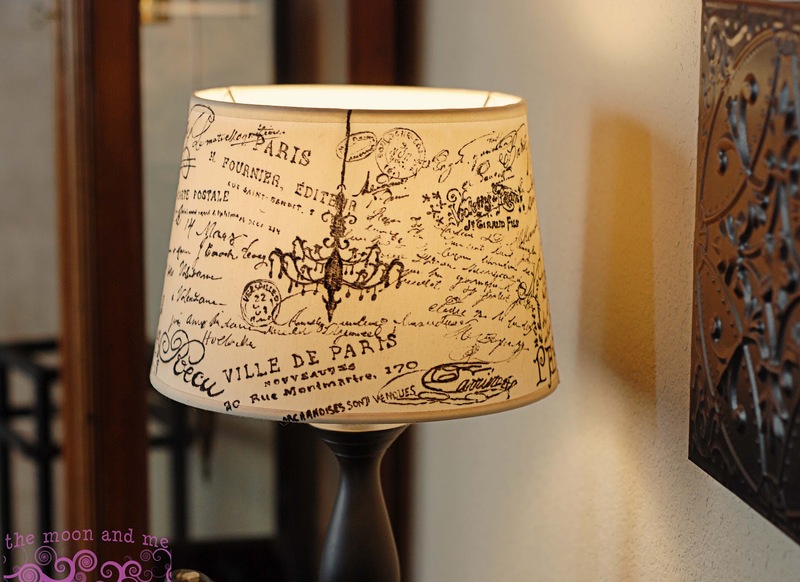 Concrete Cottage did to her lamp shade?!?" "Hey...why don't you do that?" To which I replied, "OK."
of Frenchy writing and other fun things. 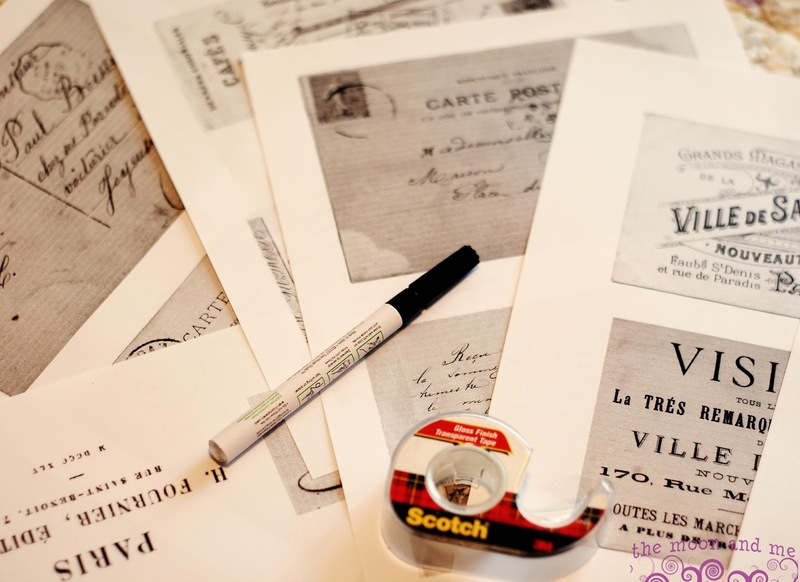 Just search for French postcards or French writing...or something. 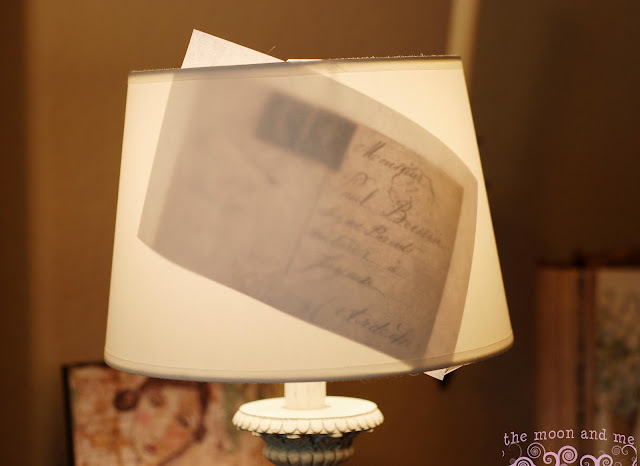 Once I printed them out I taped them to the inside of the shade. It does help to have the light on. I used a fine tip paint pen to trace the parts of the print outs I wanted. You can use a fine tip Sharpie, too. There was a little bleeding since this shade has a pseudo fabric whatever on it. I learned to use that to my advantage and worked my way all around. I didn't want it to go back to the guest bedroom. I wouldn't get to see it as much...or brag about it. Okay, so I had to have a chandelier, too. But I added a fleur de lis. I had some cold coffee in the fridge. You know, just hangin' out. In case I needed an iced mocha valium vodka latte. let it dry then did it again. Mmmmm. Not quite parchment-y enough just yet. I'm going to go with the old stand-by next, brewed tea. who knows how long it will take me to get around to that. Until then, it will just look a little faded. Take a bow, we're applauding and you sooooooooo deserve it. oh my gosh this looks amazing, beautiful job!!! Kelly, it looks AWESOME! I've got a lamp and lampshade sitting on the floor right behind me waiting for the same treatment. Imitation is the highest form of flattery, you know!!! ah, I'm jealous! So much better than my attempt....should have had something to trace - my handwriting skills are um, well let's say lacking! lol. I'm thinking I'll redo it using your technique. Love.it.very.much! Would love you to come by for a visit and follow back when you have the time! Wow and double wow! I'm going to have to try this! I'm so glad I stopped by from Debbie Doo's Newby party. This looks so professional! I would love to try it, but I don't have a very steady hand. I love, love, love this! Thank you for visiting my blog. I'm not following yours! I am a new follower BTW. Your lamp did it for me!!! Pop on by mine sometime.. I've seen Jeannine's in person...seeing as how I'm her Sis and all...and I had to click on this one from DebbieDoo's Newbie party because it looked so familiar. You did a fantastic job! I nearly thought it was hers. CASE (Copy and steal everything!!! )...in the crafty world it's not a crime but highly encouraged!!! OMG, I absolutely love it! Talk about imagination! Kelly it turned out fantastic! I'm so glad you tried it and had these amazing results!! Nice work my dear. And thanks for the shout out about my blog, you're such a sweetie!! 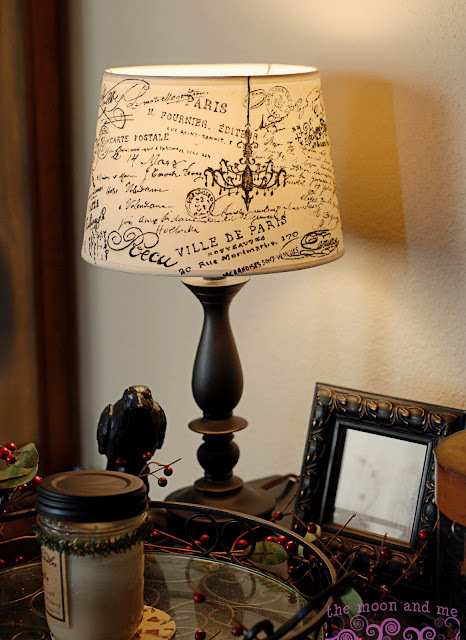 I found you through Make It pretty. I must say, your lampshade turned out divine. So very french. I love it! I am your newest follower. I hope you follow me back and say hello. I am in awe!! This is amazing!! newest follower, AND i'm going to try this, this evening! Wow!! That turned out amazing!! Wonderful job!! 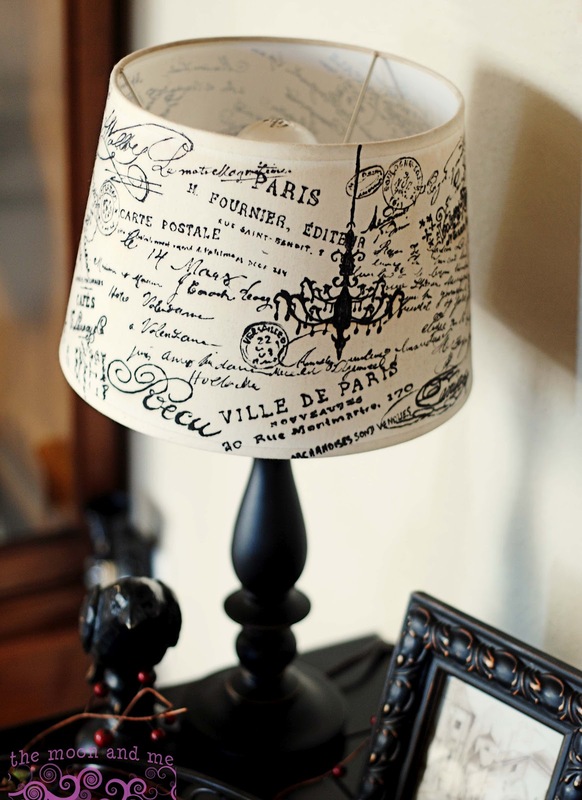 I love this lampshade! What a great job! If you never get around to the tea staining it's OK because it already looks fabulous. I'm your newest follower from the Newbie party. Hope you can stop by for a visit sometime and follow back. WOW! I love these style of lampshades, I never thought of trying to make one myself, I love your results. So simple & fabulase,Kelly.You are magicmaker!!! Great idea...and it looks fabulous! Everything you create looks AMAZING and should be sold in stores. Even if it is a copycat! Now I'm going to mosey over to the concrete cottage to do a quick (non judgemental) comparison =) Keep up the great ideas!! I love this project! 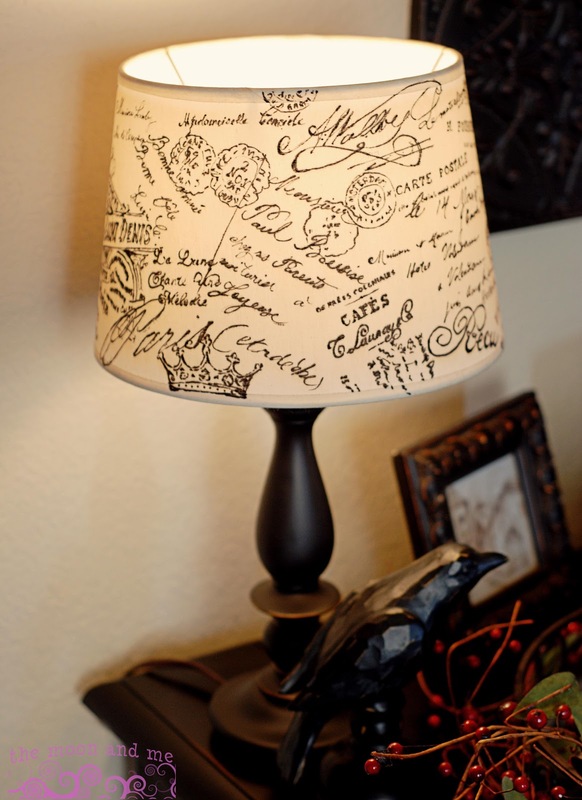 What a great way to make a lampshade extra special! Thanks for linking up this post to the BeBetsy BRAG ABOUT IT Tuesday Link and Hop - we were just amazed by how creative you are. I wanted to let you know that You Were Featured on VMG206 ~ Brag About It Tuesday's Linky Party from last week! 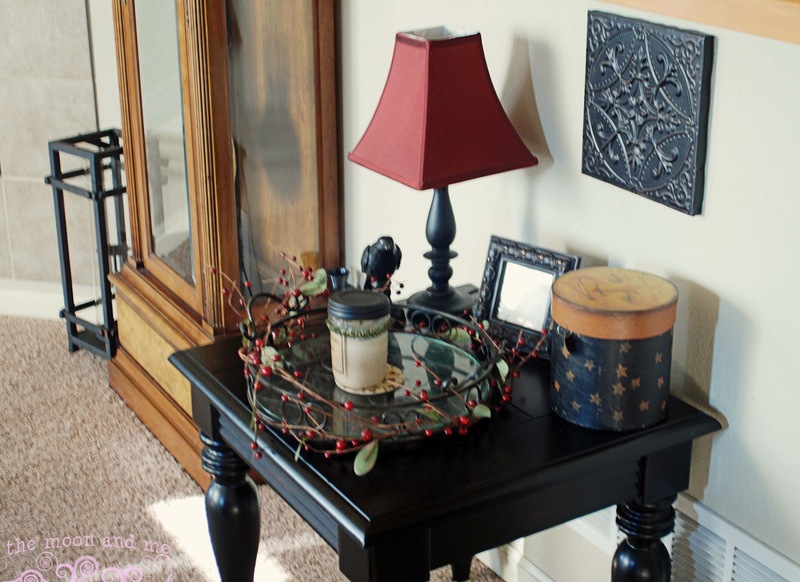 I have pinned your project to my Brag About It Features Pinterest Board here. I can't wait to see what you've been working on this week! This is just a fantastic idea!!! I hope you will share at Redoux tomorrow. 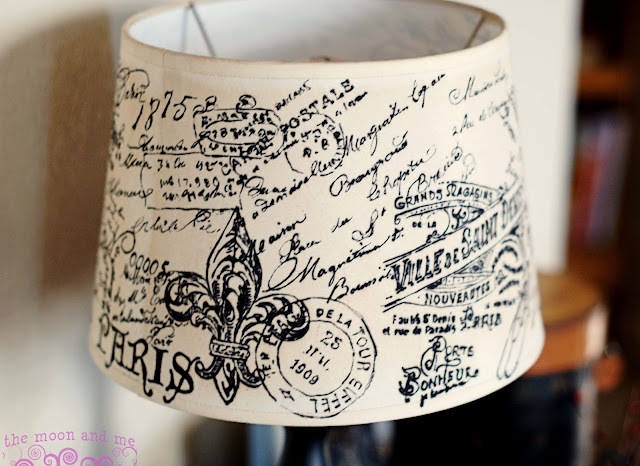 I am pinning, and hoping to make my own soon! 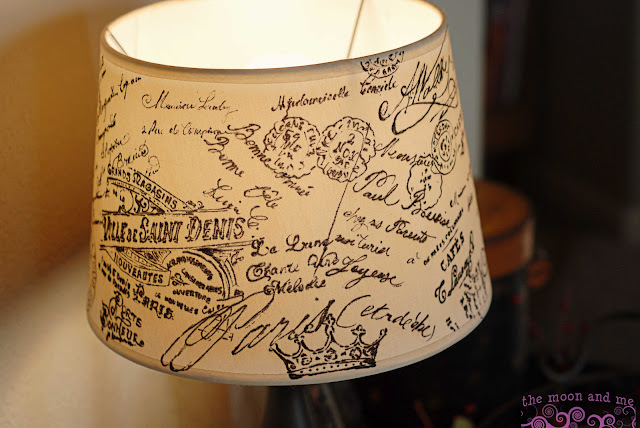 I am always on the hunt for a new lampshade idea. Visiting from My Front Porch. Wow Kelly this is awesome! 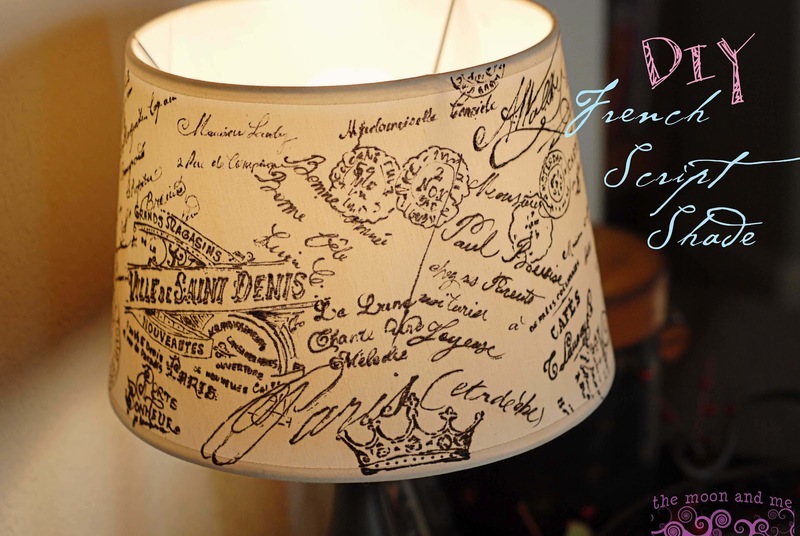 I recognize all kinds of French graphics from The Graphics Fairy on there - so pretty. Love your sense of humor too BTW! Glad I found you over at the Wow Us Wednesday Party - must follow! Kelly, this is absolutely gorgeous! 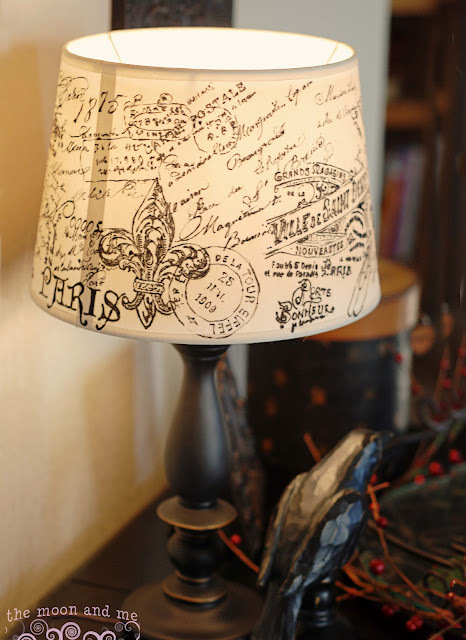 I love french script and I seriously love the idea of putting it on a lampshade. You did a fabulous job. 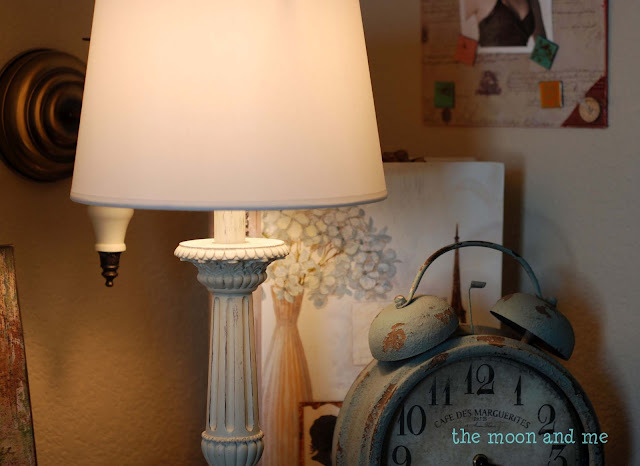 Thank you for sharing how you made it and for linking up to Thrifty Thursday. Great Project!! Would love for you to share at Simple & Sweet Fridays. 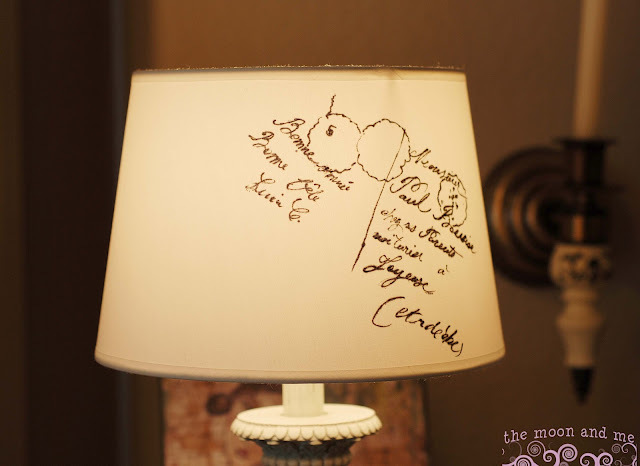 I am a complete font/script junkie so your lamp got my attention. So crazy great! Not sure I would have such a steady hand to trace all those vintage scrolly loops and such. Very cool. Visiting via 'APeekintoMyParadise" link up from over at www.ritewhileucan.com where I get giddy over all things paper and the lost art of letter writing. You may enjoy. I'd love for you to stop by and grab a button. Your beautiful lamp shade is my feature pick from last week's Throwback Thursday. Throwback Thursday will go live tonight at 8 PM. You're invited to grab the "I Was Featured" button from my sidebar (www.anallievent.com). I love this so much! Featuring at Redoux tomorrow. Party starts at 2 :00 PST. Thank you for sharing! I love this! What an awesome idea! Thank you for sharing at our TGIF Link Party at A Peek Into My Paradise! Your post is featured at this weeks party I can’t wait to see what you share this week! I just found your blog and am LOVIN' it! And whas more, this post is the answer to a problem I've had for ages, like you, I picked up a lamp in a thrift shop, the shade is just plain cream and a bit grubby looking, but I reckon that if I copy your idea I can give it just that bit of lift it needs without paying out a small fortune for a new shade. PERFECT! So many thanks for helping me see the light - 'scuse the pun! I’ve been your silent reader for quite some time and now I’m delighted to say that I’m inspired by your articles. You have shared very valuable information and knowledge that people should recognise. Thank you for sharing. I would love to see more News and updates from you. Sweet comments make me a happy girl! I love and read each and every one! I do my best to respond to all of them...even though it may take a while...questions I try to answer right away. Hi! My name is Kelly...I'm just a girl who likes to make things. I have a full-time job that offers little in the way of creativity...so this is my creative outlet. I enjoy photography and DIY and pretty stuff...but I'm not perfect. I just make it up as I go along. A Princess Party ~ and CAKE!